Ties have always been a traditional Fathers Day gift, but sometimes it’s hard to find just the right kind of tie for the right kind of dad. This year why not stitch up a custom made tie that fits your dad to a “T”? We’ve gathered several DIY tie tutorials and patterns from around the web – from bow ties to traditional neck ties to skinny mod ties, there’s a tie for every kind of dad. This is a nice, crisp, traditional handmade tie pattern and tutorial from The Purl Bee. While The Purl Bee used some crisp cotton lawn fabric for their ties, you can use any finely woven fabric made of silk, cotton, linen, or even wool. Click here for the Fathers Day Tie tutorial. The folks at Etsy share a tutorial at The Etsy Blog for printing fabric on your home printer to create a one-of-a-kind power tie! Use text to create words that describe your dad or his favorite hobby. Click here for the DIY Geek Power Tie. 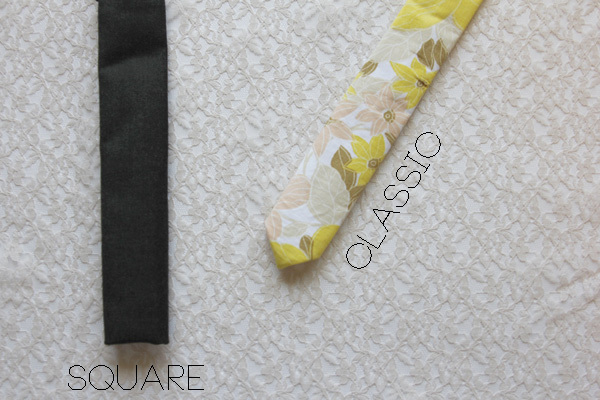 See Kate Sew has created a mod skinny tie with either a square or classic finish on the bottom. Get the Men’s Skinny Tie Pattern + Tutorial from See Kate Sew. So what if your dad is a bow tie guy? Never fear, we’ve even found a few DIY bow ties! MarthaStewart.com shares a tutorial with a template and a how-to video for making a custom bow tie. Click here for How To Bow Ties. If you are a member of the BurdaStyle.com community, check out the free classic bow tie pattern from David. Go to the Free Bow Tie project page.